Mount St. Helens volcano that blew away its north face in a massive eruption in 1980 is captured at an altitude of about 15,000 ft. The inner dome that rises from the center of the crater has been growing slowly in stages since then. The Spirit lake, completely reshaped by the eruption is in the lower right. Great aerial view. There's an entire generation that never got to see the beautiful conical form of Mt. St. Helens before it was torn apart, and know it only in this devastated form. Great arial shot showing the devastation resulting from the 1980 explosion! Super pov on Mt. St. Helens! Mt. 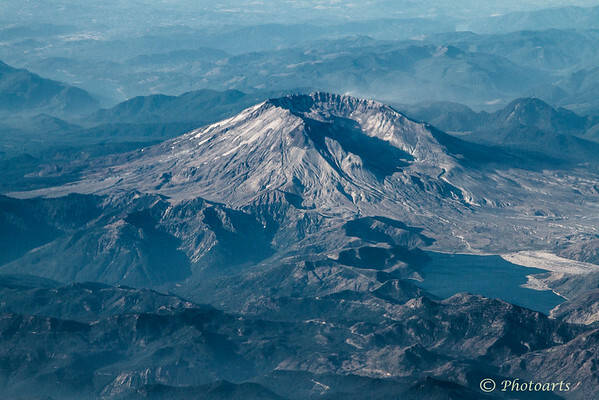 St. Helens from the air is an amazing site. You've captured it very well. Beautiful view, and wonderful light and details!